This day-long event is one of the most important milestone learning events we offer all year. Fifth grade is the age when our local public elementary schools do a specific unit on puberty and which also includes information on reproduction. This study at Faith is meant to complement that. With great intention we keep the boys and girls together as they learn about the body parts of both genders. The more we learn about each other and our common physical and emotional experiences, the better we are at being in a healthy relationship. A necessary part of this study is that parents attend the beginning and end of the event. As one person in the family grows and matures, we know that changes the dynamic of the whole group. As their child begins puberty, the parent’s relationship with their son or daughter begins to mature as well. The study covers the many changes that these young people will see over the next few years: physical, emotional, and intellectual changes as well as changes in their faith and their relationships. Most importantly we talk about how we are sacred because we are made in the image of God. Throughout the day, many discussions revolve around honoring what God has made in us and in other people. We are all God’s masterpiece! The link below connects to a video on the website for Sticky Faith. It creatively shows the stress and pressure we all feel. Each of the 5th graders could identify with the pressure of being pulled in many direction and living with expectations of many people. The kids brainstorm ways to refocus their emotions so they can feel more in control. Another video we watch together gives techniques for standing up for ourselves and our motions in an assertive way. It is from a series on YouTube called Ask Amy. Actress Amy Poehler answers girls' questions about negotiating life. She gives good straight forward advice with some humor mixed in. Finally, here are two books we use as resources for the students and parents. 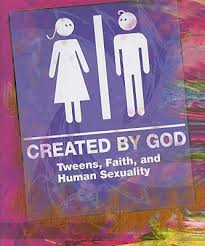 The student book Created by God: Tweens, Faith and Human Sexuality is written for middle schoolers both in reading level and content. Sometimes parents fear giving their child too much information at once. We need to remember that our kids are absorbing the world in many different ways and from many different sources. We want to make sure they have the facts in front of them. In general, kids will read "ahead" when they are ready. At this stage they mostly just want answers to their own up-coming changes. 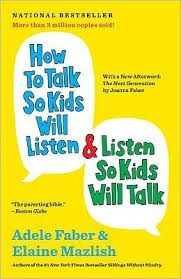 How to Talk So Kids will Listen and Listen so Kids will Talk is a great book for parents with children at any age. It provides concrete ways to communicate with our children...even if that means not talking! As I read, I found some good suggestions for my relationship with my own 22 year old daughter.